Happy birthday Nancy Farmer (House of the Scorpion, A Girl Named Disaster). In 1872, the doughnut cutter is patented in Maine. Read Homer Price by Robert McCloskey. The first successful open heart surgery was performed in 1893. Read Hope Is an Open Heart by Lauren Thompson. In 1962, Bob Dylan records “Blowin’ in the Wind.” Read The Wind Blew by Pat Hutchins; A Wind in the Door by Madeleine L’Engle; and The Wind in the Willows by Kenneth Grahame. It’s National Sugar Cookie Day. Read Sugar Cookies: Sweet Little Lessons on Love by Amy Krouse Rosenthal, illustrated by Jane Dyer and Brooke Dyer. On July 9, 1982, Queen Elizabeth II woke up in Buckingham Palace to find a stranger sitting at the end of her bed. Wearing jeans and a T-shirt, the intruder had actually planned to commit suicide in the queen’s bedroom, but then decided that wasn’t “a nice thing to do.” Instead he simply wanted to say hello and discuss his problems with the queen. Needless to say, the incident raised concern about the security of England’s monarch. In an even more bizarre twist, an author had already written about—but not yet published—a scene about another intruder to Buckingham Palace who also needed to talk to the queen about her problems. Her name was Sophie, the protagonist of one of the funniest children’s books ever written, Roald Dahl’s The BFG. Initially told as a story to Dahl’s granddaughter Sophie, the book begins with young girl unable to fall asleep. She sees a giant blowing something into the windows down the street. This benevolent monster, the Big Friendly Giant, takes her to his home and introduces her to his strange life. With his huge ears, he hears dreams and sends them with a blowpipe into the bedrooms of children. He also catches nightmares, bottling them up. Because he doesn’t eat humans, he must subsist on food like the revolting “snozzcumber” or drink “frobscottle,” a fizzy concoction that unfortunately causes flatulence, what he calls “whizzpoppers.” Since the human-devouring giants need to be stopped, the BFG prepares a doozy of a dream for the queen of England and leaves Sophie on the queen’s windowsill to help her interpret it. The BFG contains all of Dahl’s best qualities as a writer—inventive word play, nasty villains, lots of action, and a large dose of nonsense. Dahl had a genius for fashioning unforgettable characters like the Big Friendly Giant. Most readers of the book think that the BFG would be even more fun to hang out with than the queen of England, and in the story they get to enjoy his company for two hundred pages. 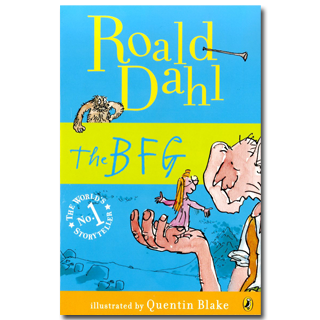 So rather than visiting the queen today, you should pick up The BFG and other delightfully funny books by Roald Dahl. And raise a “frobscottle” in his honor! Originally posted July 9, 2011. Updated for . I think anything by Roald Dahl makes my favorites list, including the BFG. I’ve recently been giving collections of his books as birthday gifts, they are great for boys and girls. Plus, most aren’t too long so they don’t scare away reluctant readers. Also, thanks for letting us know about sugar cookie day – the kids and I will have to whip up a batch! This book came up next in my stack, actually Anita’s stack, (so to speak) I was not overly enthused by the idea of the book, nor the art. However, I soon realized it was a truly great children’s work, one of the most creative and humorous reads I’d come across. It was just somehow, a delightful surprise to me. I am always particularly happy when I book I don’t think I will like turns out to be one that I absolutely love. That’s part of what makes reading so special. An old favorite that’s on my list to reread this summer. I actually found snozzcumber “candy” in England a few years back – so much fun! The BFG is our family favorite Dahl book. We read it to each of our boys, it got better with every reading. This was the only book my sister and I would fight over — fight over who got to read it next, in fact. This was a favorite that we passed back and forth and still love to go back to. A wonderful story and I still shudder whenever I think of snozzcumbers. This is a great book to use with 3rd/4th graders. I like to read it before the holidays and then make them a dream jar as a gift. The children always love that their teacher is reading about flatulence. I love that I can now share a little more background/history with them… Just need to figure out how to talk about suicide in a way that’s appropriate for kids…hmmm. I can’t wait for this movie. Love the story of the Big Friendly Giant. Agreed. I hope they do the book justice.